We want to wish you a great winter solstice and abundance for the new year and beyond! 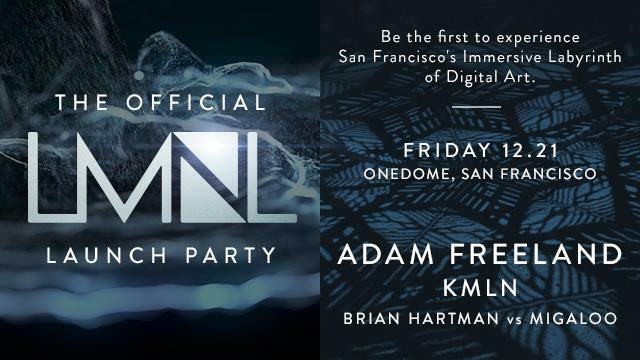 Please check out Onedome’s upcoming LMNL launch event, join us at The Midway SF on New Year’s eve, and view our recap of this year’s Keyframe events! WE APPRECIATE YOU AND THANK YOU FOR YOUR CONTINUED SUPPORT! Enjoy this remix of Liquid Bloom’s Whispers Of Our Ancestors by Momentology & DJ Taz Rashid! Also be sure to check out the new Whispers of our Ancestors Remixes album review on Reality Sandwich! On December 21, ONEDOME is excited to invite you on Winter Solstice to be one of the FIRST to experience LMNL – San Francisco’s premiere immersive experience featuring a labyrinth of interactive digital art… and they are throwing an epic launch party that will go down in history, to mark this momentous occasion as they reveal the magic that is LMNL to the world! Headliner Adam Freeland, one of the pioneers of electronic music is supported by rising stars KMLN, Brian Hartman and Migaloo. You get access to the launch party, their resident herbal elixir bar Elixart, and you will be the first to experience LMNL – 14 interactive installations and rooms, a 60+ minute, open flow (museum-like) immersive experience, located within the 10,000 sq ft lower level of Onedome, San Francisco’s interactive arts & entertainment venue. LMNL’s doors are officially open to the public on December 22nd. This event is 21+. 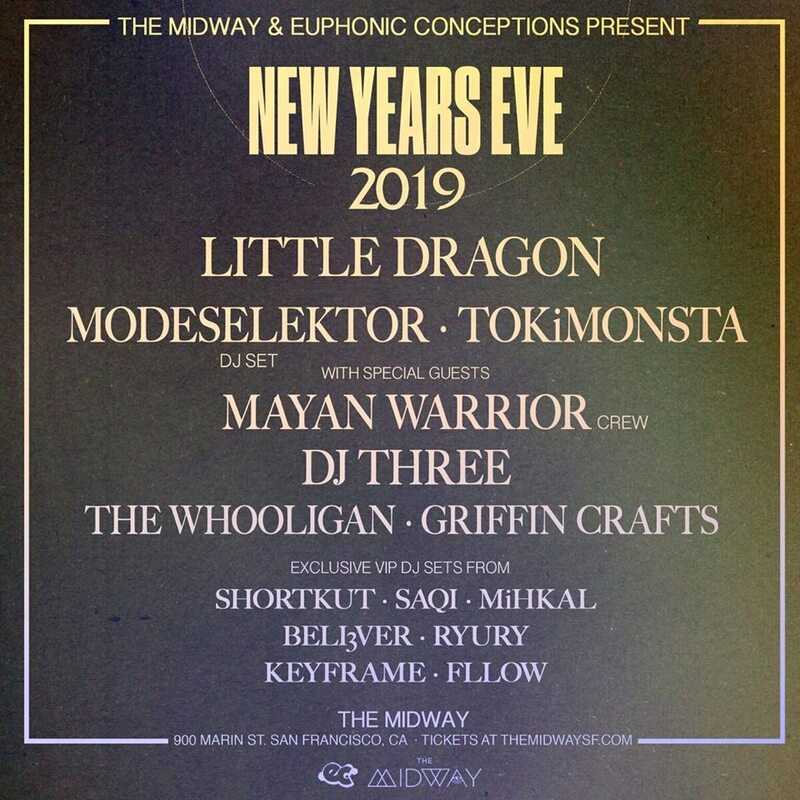 Keyframe is honored to play the VIP room @TheMidwaySF on New Year’s! Celebrate NYE 2019 in style at The Midway’s New Year’s Eve extravaganza – the most ambitious event to date with more surprises than ever before. With a stacked and eclectic lineup featuring music from Swedish electronic band Little Dragon, German underground heroes Modeselektor (DJ set), versatile DJ/producer TOKiMONSTA, Burning Man sound camp Mayan Warrior, plus many more TBA, there is guaranteed to be something for everyone. WE WISH TO THANK ALL of our partners, sponsors, and attendees for all the events we’ve had this year! We’d like to share these memorable moments with you, so please see below to view the photo albums! 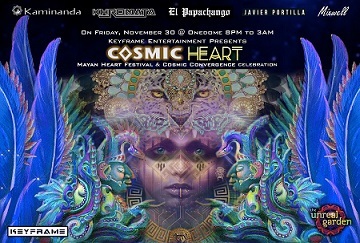 We’re honored to have hosted “COSMIC HEART” on November 30th, the San Francisco PRE-PARTY to two very special festivals happening in Guatemala in December: Mayan Heart Festival & Cosmic Convergence 2018. The event took place at the Onedome Mixed Reality Art Experience, a space where Augmented Reality, projection mapping, soundscapes, food and drink, and even the physical space itself all work together to immerse attendees in a fantastical other world known as “The Unreal Garden.” There was a cacao ceremony honoring both festivals and a musical journey spanning multiple genres & cultures with Kaminanda, Khromata, El Papachango, Javier Portilla, and Mixwell. On October 17th @The Great Northern in SF, Keyframe showcased the intersection of VR and Electronic Dance Music with talks from Nathan of Survios (Electronauts), TheWaveVR, TribeXR, The Virtual Rave and SwanVR. The event included demos from High Fidelity, Exit Reality, Liquid Light Project, NewPathVR, Visual Reality, and performances by Solar Theory, Torkom Ji, and Michael Strauss. The event was co-produced with ImagineX Productions and ARTandVR, and had sponsor support from SUBPAC, Pyramind, Chronos Global Academy, VRARA, EMA and the VRS Conference. View the event photo album on Facebook, and for more details, including talks and photos, please visit our VR and Electronic Dance Music event page. Keyframe is honored to have screened films, conducted a talk, and played a DJ set at Ozora 2018! On March 8th, Keyframe & FilmHero hosted a second San Francisco screening of Amplify Her SF in celebration of International Women’s Day. Directed by Ian MacKenzie and Nicole Sorochan, “Amplify Her” follows three Electronic Dance Music artists battling demons from their painful pasts to emerge as beacons in the global festival scene. Blondtron, Applecat and Lux Moderna overcome isolation, illness, and gender bias to give life to their creativity. Shortly before, in November 2017, Keyframe sponsored the Amplify Her San Francisco Purple Carpet Premiere at Castro Theatre. View the SF Premmiere photos on Facebook. On January 18th, Keyframe-Entertainment and Public Works hosted “The American Jungle” San Francisco Film Screening & After Party! View the trailer below and the Afterparty photos on Facebook! Keyframe is also honored to have sponsored the Visual Reality area at VRLA on May 4-5, 2018. VISUAL REALITY has been bridging the gap between art, technology and consciousness since 2016. They design experiences and produce events that open hearts, lift spirits, and blow minds. Their pioneering multi-sensory events blending VR with psychedelic augmented art, live audio/visual performances, and sound healing meditations provide a unique perspective on conscious entertainment and transformative technology, as well as an engaging restorative experience. We continue to work in the Virtual Reality event space; you can learn more about Julian’s other VR projects here. We welcome collaboration for future multi-city VR events, please contact us to co-create!